So i play lacrosse and was the lacrosse captain for my high school and on the day of my birthday April 16, 2008, I tore my acl during a game. It didn't feel that bad at all. I am a defender and I was lunging down to scoop up the ball and while I was getting up the opposing team ran into me. I fell down and I just thought that she ran me down (she was a little big and im on the petite side and so im used to being rammed down). While I was falling I heard a pop sound. Well so I tried to get up because the referee called it and it was going to be my ball. I tried getting up and i just collapsed and got carried off the field. I just thought that i didnt do anything major to my knee because I felt no pain. I just couldnt bend it all the way or straighten it. Went to the doctor the next day to hear that i tore my ACL and i broke down crying. 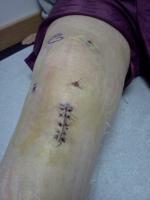 My surgery was on May 8, 2008. I went in knowing what the surgeon was going to do to me,but I had no idea what i was going to feel. I should just say that the pain after surgery laying at home in my bed was excrutiating. I felt like i could feel the nails in my knee. I would just cry all day long. During the summer, I started p.t and he said that i was doing extremely well as i regained full range of motion quickly; like within a week. So by the 4th month i was all fine, except that the doctor told me that i couldnt run. I stopped p.t after the 4th month. Now im trying to get back in shape to start lacrosse again, but am a little hesitant as I dont know how much my knee can handle and am scared it will give out again. Hopefully this kinda helped at least one person knowing that it isnt THAT painful.